What happens when economic development has real power behind it? CMU is not only a faithful servant to the city of Canton, MS, but CMU also aids the global economy through many large Canton businesses including the world’s largest Nissan plant. CMU serves over 10,500 customers with the four utilities: water, electricity, natural gas and waste water. With that said, our goal is not to be the largest utilities company. Instead, CMU strives to provide its customers with reliable service in all four utilities at the most economical price. CMU provides Canton businesses with all of the resources they need to compete in any market, and we would love to have your business join our community. 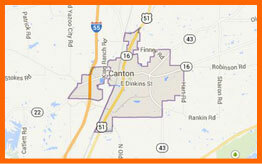 Canton economic development is a priority for CMU. Our site-selection team is ready to connect your company to a vibrant, growing economic region that offers competitive tax rates, multi-modal transportation systems and skilled, affordable labor. Contact us for more information at 601-407-3214.